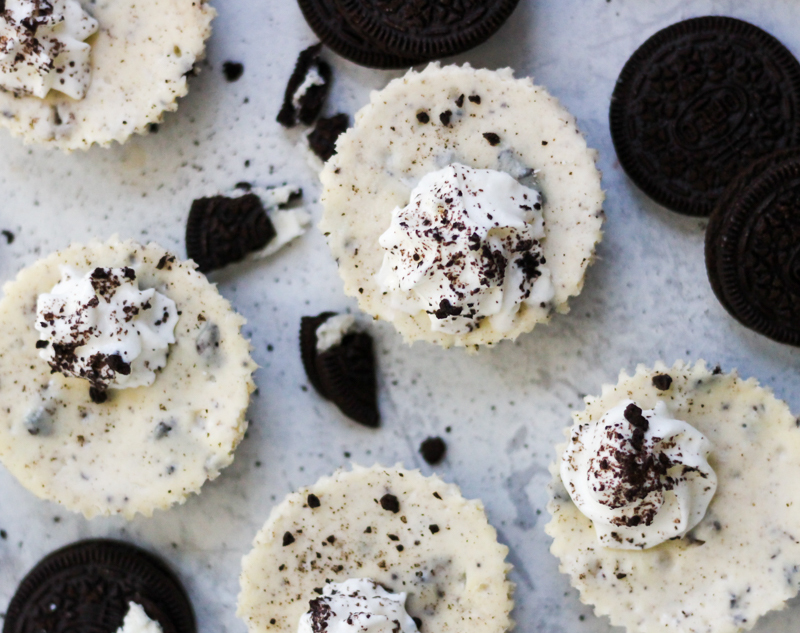 I have been meaning to make these cheesecakes for quite some time now and had every intention of buying a pack of Oreos for that specific purpose….except I could never make them fast enough before all the Oreos were gone! In a food processor, pulse cookies until finely ground. Melt butter and stir together with the cookie crumbs. Prepare a muffin pan with liners and divide crust equally among 12 cups. Press firmly into the bottom and bake for 10 minutes at 325 degree Fahrenheit. Set aside to cool. In a medium size bowl, beat the cream cheese and sugar together on low speed. Add salt and sour cream and mix until combined. Fold in the crushed up Oreo cookies. Divide batter equally into the muffin liners. Place cheesecakes in a water bath and bake at 300 degrees Fahrenheit for 20-30 minutes or until cheesecakes are set around the edges and slightly jiggle in the center. Cool completely and refrigerate for a minimum of 4 hours before serving. Garnish with whipped cream if desired.